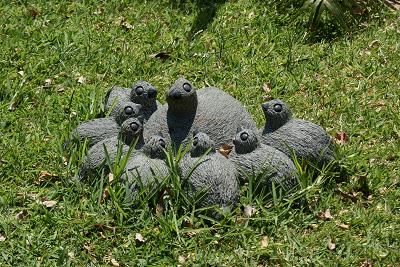 Unless the most complex projects you aspire to manage are your autobiography or the garden design all alone in your house, be prepared to interact with lots of colleagues. DIFFERENT ORGANIZATIONS. The way those individuals are organized is going to make a big difference and influence the way you are going to manage your project. It is therefore beneficial to have a clear picture about the different types of organizational structures you may work with during your career as project manager. It is divided in different departments such as sales, marketing, engineering, finance, manufacturing, quality, EHS etc..., with each of those depts grouping individuals having similar skills/duties. 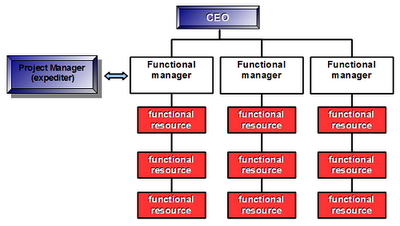 Employees report to the respective functional manager. 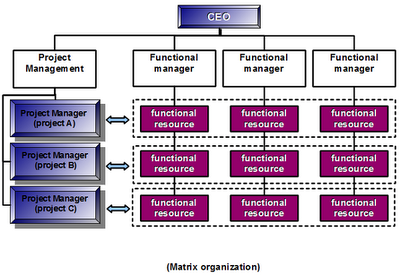 In turn, the functional managers report to the company top management and then to the CEO. All departments work individually based on their function, but in synergy each other to reach the business goals. The strong hierarchy featuring this kind of organization determines a precise definition of the roles of the resources working therein. The split is made based upon specialties or duties (ie. manufacturing, accounting, sales, logistic...). This kind of structure is typical of small businesses, but it is not a must. Companies producing different products or having facilities located in different regions may also create divisions for each product or location, and outline functional organizations therein. Pros: clear understanding of roles & responsibilities and efficient communication, fewer vertical levels. Organization suitable for serial and mass productions. A robust decision making process, extremely burocratic at times, enables the organization to materialize decisions sharing at all levels the appropriate information. Employees have potential to grow within the pertaining department and this a point of strength for motivating people. Cons: conflicts between departments, limited capacity to expand business and manage projects where significant changes are required. Project Manager viewpoint: project managers are not mandatory resources in this kind of organizational structure. If they are present, they may serve as facilitators or expediters only, with a null-to-limited authority. The environment may be not mature enough to undertake a complex project or a quick business development. Project managers can't aspire to a burning career most of the times, differently from other employees. To the opposite side with respect to the pure functional organization, a projectized structure is completely tailored to manage projects. You may hear that business defined "task force" also. A project manager working in this kind or organizational structure has the direct control on the reporting functions, for the period of time assigned to the project to be executed. 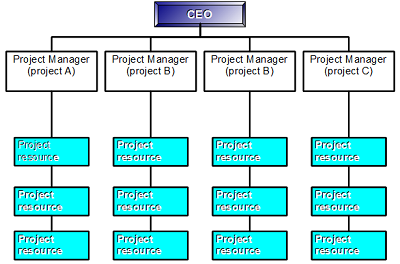 Typical examples running with the above structure template are the global EPCs (engineering, procurement and construction companies), which usually have a permanent staff organized with project managers/directors at the top and additional personnel hired ad hoc, depending on the projects' magnitude. Pros: project team members are often localized together. Projects benefit of the prioritization of tasks decided by a single authority, few conflicts to be solved in between departments. Availability of multiple resources, as many as the project needs. Organization suitable for long lasting projects. Cons: less interaction and transfer of knowledge between departments and few opportunities for the growth of the employees' skills and expertise. Duplication of resources for each project. Potentially, inefficient use of resources. Potential abuse of authority of the project manager. Project Manager viewpoint: project managers have a complete independence and budget control for the project, they "own" the resources who lead and they do not borrow them from functions. The responsibility of the project is considerable, but it goes hand in hand with the empowerment to directly control the resources available. This kind of organization is basically a combination of the two models previously shown. The organization is still divided in functions (let's imagine them in vertical directions) but also per projects (let's imagine in horizontal directions). The project managers are usually part or full time engaged and have medium-high authority to the functions. Individuals from functions are shared among the projects, project teams can be created grouping resources to support the project manager the duration of the project. Such kind of structure was introduced around '60 in the Aerospace industry and is particularly suitable for large companies running a considerable number of projects at the same time. Pros: this kind of organization promotes delegation of decisions from top management to project managers and subsequently their empowerment Work is managed in such a way that the project managers concentrate on the administrative tasks of the project they look after, while the functional managers focus on the technical. Decisions are effective and thoughtful. Cons: dual reporting of the functional resources (usually they report dotted line to the project managers and solid line to the functional managers) with subsequent potential conflicts between the two "bosses". As a side effect, we may see more confusion than the other two models described above. The workload is in general higher in this kind of organization, as the resources are utilized with the aim to maximize their productivity for many projects contemporary. Project Manager viewpoint: project managers have a significant control on the project schedule and on the outcome of the functions' work. Project managers have a moderate-to-strong authority in deciding the priorities and in escalating issues. They are surrounded by highly motivated and skilled individuals. Dedicated project team members, representing key functions and subordinated, support the job and usually report dotted line to the project manager. Thanks for sharing the original link to this post if you found it interesting! Project Manager: leader or manager? What do you expect from your boss? What can I do to be a leader? If you need a ready to use "To Do List" template, click on the above image and download our file in excel format for free. Follow "The Project Manager Pad"
Blog, surveys and column titles special font by Koczman Bálint. ©2012-17 projectmanagerpad.com. All Rights Reserved. Copyright by the credited authors where noted. Awesome Inc. theme. Powered by Blogger.